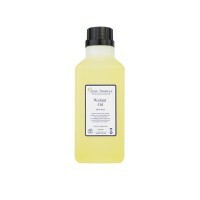 Macadamia Nut Carrier Oil is a rich, restorative oil. It can help fight the signs of ageing and is an ideal carrier oil for the face. Macadamia Nut (Macadamia Integrifolia) Oil comes from the pressed nuts of the Macadamia Tree. Macadamia Oil is very beneficial for the skin, enhancing the skins own restorative and protective properties and helping to support the skins ability to heal itself. It is rich in nutrients and essential fatty acids and has exceptionally good absorption properties. Macadamia Nut Oil has historically been used for scars, sunburn, minor wounds and other skin irritations. It is particularly popular as a facial massage oil in beauty salons and is also good for adding moisture to the décolletage after sun exposure. Macadamia Nut Oil has an exotic scent which works well with robust, woody aromatherapy essential oils such as Sandalwood, Cedarwood and Frankincense. Professional Tip: Due to its scent and viscosity the experts at Base Formula recommend diluting it with a lighter carrier oil at 5-20% depending on skin type.